A navicular fracture is a fracture of the wrist, involving the navicular, or scaphoid bone. It is not a terribly common sports injury, but does pose some interesting complications due to the navicular's shape and blood supply. 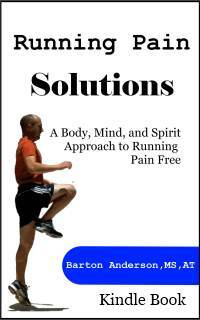 It may or may not require surgery, and definitely must be managed appropriately. Lets take a closer look at this sports injury. 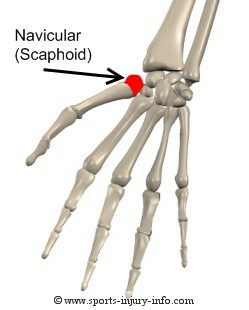 The navicular bone is one of the carpals of the wrist. It is found along the thumb side of the wrist, just below the base of the palm. It can easily be found by extending your thumb, and looking at the wrist. See the two tendons that run from the forearm up to the thumb? The navicular sits between then in the small space that is created when the thumb is extended. This space is referred to as the anatomic snuffbox. The navicular bone is irregularly shaped, and the blood supply flows in from just one tip of the bone. This is important when it comes to proper healing, or lack thereof, and I will discuss this in just a moment. While a wrist fracture can occur with any force strong enough to cause the bone to break, by far the most common mechanism of injury is to fall on an outstretched hand. As you absorb your body weght on your wrist, the carpal bones are compressed, and the navicular breaks. This is by far the most common way to fracture the navicular, and it can occur with many different sports. The most common symptom of a navicular fracture is pain. It is usually located along the thumb side of the wrist, directly over the bone. Pain may also radiate into the hand and forearm. Swelling may occur over the injury site, and you may loose range of motion, both at the thumb and wrist. Navicular fractures must be treated very carefully. If you think that you may have broken your wrist, you should see your physician immediately. They will take an X-ray to determine if the bone is broken. Initial treatment usually consists of placing the wrist in a cast for several weeks, and then a splint for an additional amount of time. The problem with this wrist fracture is that because of the shape of the bone, the blood supply to part of the navicular may be cut off, thus slowing the healing process. Part of the treatment involves careful monitoring of the healing to make sure that the bone is indeed getting better. Make sure that you follow your physicians instructions to allow for the best outcome. If the navicular fails to heal correctly, it may require surgical intervention to put the two pieces back together. Navicular fracture is not a common sports injury, but it can occur with any sport, especially those in which you may fall. Treatment should be directed by your physician, and generally involves a cast for several weeks. If the navicular fails to heal, surgery may be necessary. Take care to have your wrist looked at if you think you may have suffered a wrist fracture.